[media number=1 size=small align=left]Yao Family Wines. [/media] Fresh into his retirement from the Houston Rockets, Yao Ming has taken up viticulture and is hoping his cachet in China will help him sell his wine there. The 7-foot, 6-inch former Rockets center has started Yao Family Wines in Napa Valley, the Wall Street Journal reported, and its first wine, YAO MING, a 2009 Napa Valley Cabernet Sauvignon, will be sold in China for 1,775 yuan (US $289) per bottle. Only 5,000 cases will be produced. “Yao Family Wines is a bit different from other sports figures’ vanity wines in that it is being targeted primarily for the Chinese market,” Jon Bonné pointed out at Inside Scoop SF. 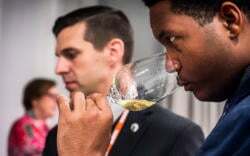 China consumes more and more wine every year, but the country “has a heavy bias toward French wines,” Jason Chow wrote in the Wall Street Journal. Ming hopes his appeal can help carve out a niche for California wines. The wine is currently sourced from grapes from several vineyards, but the winery is exploring purchasing its own land. As for the taste? “We tasted a lot of wine together and got to know him in a way so I could express his personality in the wine,” winemaker Tom Hinde told the Wall Street Journal. “He’s physically imposing, but he’s also very personable and gentle. We wanted to capture that in the wine.” The Huffington Post reported that Yao Family Wines will be available in the U.S. next year. The retired basketball star has moved back to China and is living in Shanghai, where he owns the Shanghai Sharks professional basketball team. He is also attending classes at Shanghai Jiaotong University. Ming auctioned off some of the wine and a pair of his shoes at a fundraiser for the Special Olympics in China Sunday night, Want China Times reported. “Very happy that my first bottle of wine helped raise 150,000 RMB (about $20,000) for Special Olympic,” Ming tweeted Monday. “Will yao ming break foot again stomping grapes?” Michael Hoinski jokingly wondered upon hearing the news.